• Moderate/advanced gum disease – This occurs when the gums are bleeding, swollen or red around most teeth and the jawbone has begun to recede. • Localized gum recession – The infection which propagates moderate or advanced gum disease often begins in one area. Gum recession may also be caused due to over brushing with a hard bristle brush, or due to a tooth that is not positioned properly. Immediate treatment is required to prevent further spreading. • Before crown lengthening – The periodontist may lengthen the crown of the tooth by removing surrounding soft tissue to provide more tooth exposure. • Ridge augmentation – This procedure, often called “recontouring” may be required to correct an uneven gum line. Before embarking on treatment, a periodontist needs to treat any bacterial infections and periodontitis. Because periodontal disease is progressive, it is essential to remove the bacteria and calculus build up to halt the spread of the infection. 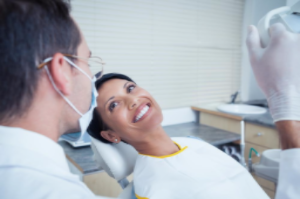 Your trusted La Grange dentist, Dr Qureshi will be happy to advise you on effective cleaning methods and treatment options. Call us today at 708-482-4420 today to schedule an appointment.